Roadway/Water Nearby: This playground overlooks the Black River. A rock and water play space are also included within the playground (see parent comments). Adapted Equipment: Adapted swings, handicap accessible play set, hand-activated activities, glider and more on a turf playground that is wheelchair friendly. 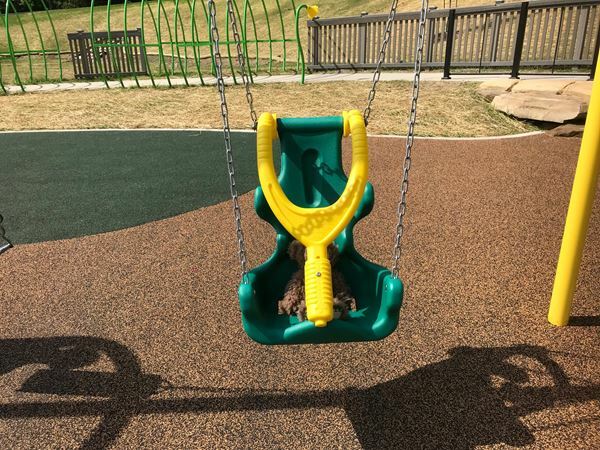 Parent Comments: This renovated playground opened in 2018 and includes a diverse selection of activities for children of all abilities. Central to the playground is a rock and water play area and families should be prepared for their children to get wet. The playground is identified as a Playcore National Demonstration Site for its attention to the 7 principles of inclusion. Photos were taken on August 3, 2018 at Cascade Park in Elyria. For more playgrounds in the area that have been recommended by Connecting for Kids families, please see our parks and playgrounds list. This swing was rated for ages 5-12.